Republicans in Congress belatedly closed ranks behind Mitt Romney this past week, with House Speaker John Boehner and Senate Minority Leader Mitch McConnell abandoning their neutrality in favor of the clear nominee. The goal is a happy political marriage until Election Day in November—and, ideally, beyond. Arranged marriages of this sort—between presidential candidates and their parties’ members in Congress—are practically mandated by the election cycle. But historically, they’ve tended to produce shaky unions—and there’s good reason to believe the relationship between Romney and the Tea Party-driven congressional Republicans will be exceptional only in the severity of its uneasiness. This is not an example of passionate matrimony, but a mere wedding of convenience—and it’s safe to say the honeymoon won’t last long. To be sure, there are always tensions between a presidential candidate and his congressional party. Their strategies are never in perfect alignment, because they need to reach different electorates. Presidential candidates focus on an electoral college map, which means emphasizing some states and ignoring others—the latter to the detriment of House and Senate candidates from those areas, who miss out on the money spent and raised by the top of the ticket, and the get-out-the-vote organization it sets up. For their part, all lawmakers share a paramount aim—assuring their own reelections, and keeping or winning a Congressional majority. If the presidential candidate can help, great. If not, as Newt Gingrich gleefully showed Bob Dole in 1996, they will readily throw the presidential candidate under the bus. This often becomes apparent in the issues that compete for spotlight in an election year. Presidential candidates may focus on issues or send messages that congressional candidates would prefer to avoid—and congressional leaders may focus on issues that the presidential candidates want to shun. (Sometimes this is simply because the legislative timetable is out of sync with the presidential candidate’s needs.) So when Bill Clinton mentioned gun control and an assault weapons ban in 1992, it made Democrats in Congress from the South and Southwest cringe. When George W. Bush ran as a compassionate conservative in 2000, it drove uncompassionate right-wingers batty; when those Congressmen and Senators adopted a hard edge, he had to try to temper it. 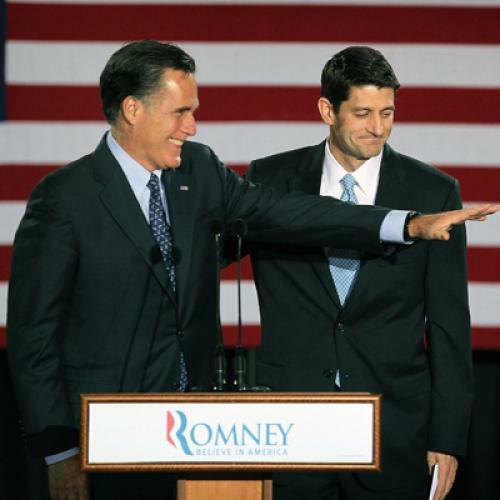 But when it comes to Romney and his fellow Republicans in Washington, these inherent tensions are amplified considerably. At the center of the problem is the major gaffe of the campaign (gaffe in the Michael Kinsley sense: The utterance of an inconvenient truth): Romney spokesman Eric Fehrnstrom’s admission that after securing the nomination, Romney would do a reset, shaking the Etch-A-Sketch to pivot from his hard-right positions toward the middle, where the crucial swing votes reside. Congressional Republicans have never had interest in facilitating such a pivot. Indeed, they are already taking steps to prevent it. Start with the budget designed by Representative Paul Ryan, which House Republicans passed on a party line vote, and which Romney warmly endorsed. While that endorsement may have won Romney some credibility among conservatives, it also promises to tie his hands considerably if he wins the election. To take one example: The Ryan budget says that it will reduce all discretionary spending, domestic and defense, to 3.75 percent of GDP by 2050, less than half of what it is today; but Romney has also pledged to put an ironclad 4 percent of GDP floor under defense spending alone. Taken together, then, a Romney administration would be committed to abandoning the entirety of non-military government. No air traffic control, no Coast Guard, no transportation, energy program, NIH, CDC, Customs, FBI, NASA, and so on. None. Of course, that is 2050, decades off. But the Ryan budget also poses headaches for Romney right now. It jettisons the bipartisan agreement reached last year to avert default, offering sharply lower discretionary domestic spending numbers for next year’s budget. That means there’s a looming confrontation between the House and the Senate over their respective spending bills, which could result in a government shutdown when the new fiscal year begins on October 1—less than five weeks before the election. For House Republicans, mostly from safe seats dominated by a feisty conservative base happy to have a confrontation, that is just fine. For Romney, not so much. In the meantime, the Ryan budget numbers have been translated into a dozen specific spending ceilings for Appropriations subcommittees. That means the vague promises of cutbacks are in the process of becoming concrete proposals for cuts in specific programs. To pick an example, we already know that the House will propose a drastic cutback in funding for food stamps. At a time of high unemployment, that will allow President Obama to conveniently portray not just the GOP, but Romney personally, as bent on taking food out of the mouths of poor children for the purpose of protecting tax breaks for billionaires. The food stamp cut will be matched or exceeded in coming months by other even less popular cutbacks, in health research, farm subsidies, food safety, and a host of popular programs. The Romney campaign would probably like to distance the candidate from some or all of these cuts, but it’s exceedingly unclear if he’s prepared to deal with the subsequent blowback from the Republican rank-and-file. But it isn’t just budgetary matters that the Republican Party has boxed Romney in on. As a general election candidate, Romney would no doubt like to broaden his appeal among women and reduce the huge gender gap that he currently faces—but such a pitch is complicated by the commitments that have been made by others in the party, and have subsequently earned his tacit endorsement. Nearly all congressional Republicans voted against the Lily Ledbetter Act on equal pay for women (most Senate Republicans filibustered against it); Romney, for his part, has remained silent on the issue. At the same time, Romney has offered full-throated support for Wisconsin Governor Scott Walker, who faces a recall election in early June; Romney has yet to comment on the fact that Walker is about to sign a bill that repeals Wisconsin’s equal pay for women. Mitt Romney would no doubt like to press a reset button, the better to appeal to voting blocs like women and Hispanics who now disdain him. He also clearly wants to sustain a united Republican party behind his candidacy. It does not appear, however, that he will be able to have both.